While providing explorations of a range of material realms of the Neolithic, including mortuary practices, ritual, architectural systems, and settlement patterns, the chapters in this section share a common interest: examining the possible ways in which different forms of material culture reflect growing social differentiation and the social use of ritual practices in Pre-Pottery Neolithic contexts. Traditional arguments for the emergence of social differentiation in the Neolithic have often failed to provide detailed considerations of archaeological correlates and data sets. Through in-depth exploration of mortuary practices, architectural systems, the organization of ritual, and consideration of how Neolithic site and regional settlement patterns might reflect past social organization and change through time, the authors address the nature of Neolithic social systems and the emergence of social inequality in general. In Chapter 5 Nigel Goring-Morris examines the archaeological evidence for variability in mortuary practices seen at the Middle Pre-Pottery Neolithic settlement of Kfar HaHoresh and places ideological, ritual, and mortuary practices within a wider developmental context of the Levantine Pre-Pottery Neolithic. He argues that mortuary and architectural data, such as differential treatment cf the dead through the elaborate painting and plastering of human skulls in the MPPNB, indicate that incipient social hierarchies and ritual ideologies would have been necessary to regulate and edify increasingly complex interpersonal and intragroup relationships, particularly in the control over economic resources, land tenure, ownership, and inheritance. In light of the variety of mortuary practices seen at Kfar HaHoresh, as well as those noted from other settlements, Goring-Morris argues that this site may have served as a secluded regional mortuary/ritual center, potentially visited by kin from surrounding settlements for common rituals associated with funerary rites. Moreover, the author argues that the codification of funerary tasks are linked to increases in the size of communities, adjustments to new social and economic systems, and the breakdown of egalitarian lifeways. This is believed to be expressed through the emergence of differential wealth, ownership, and the development of differential inherited status in the MPPNB. Working on the assumption that the power of household ritual is based, in part, on the realization that mortuary practices are a form of public action rather than a direct reflection of the status, authority, and importance of the dead, Ian Kuijt, in Chapter 6, examines mortuary practices during the Middle Pre-Pottery Neolithic B period in the south-central Levant. The author argues that mortuary rituals were organized by a series of ordering principles based on the age, and possibly status, of the deceased. Kuijt explores three dimensions of regional mortuary practices: the employment of decapitation as a common theme, the numeric organization within human skull caches, and the social impact of secondary mortuary practices and skull caching on community integration and cohesion. It is argued that the development cf specific ritual practices were linked to the need to maintain existing household political, economic, and social ties during times of social, resource, and environmental stress. Thus, Kuijt envisions Neolithic ritual and mortuary practices as having been intentionally employed as a means of consolidating community membership, and that similarities in these practices across much cf the Near East illustrate the importance these practices played as physical and symbolic vehicles for the creation of social meaning and community identity. In a detailed case study of data from 'Ain Ghazal, Gary Rollefson outlines how the nature and location of human burial practices, the use of small animal and human figurines, as well as stylistic changes of large statuary from the Middle Pre-Pottery Neolithic B period to the Pottery Neolithic period inform us as to changes through time in the employment of specific ritual practices at an individual settlement. Available evidence from 'Ain Ghazal indicates that in the MPPNB different burial systems reflect—either symbolically or physically — some form cf differential status of individuals at the household and community level. Reflecting upon the architectural evidence at 'Ain Ghazal throughout time, Rollefson notes that as with other Pre-Pottery Neolithic settlements in the Near East, there is evidence to suggest that rare buildings were designed for community rituals. He directs attention to the past existence of different forms of ritual behavior that may reflect increasingly inclusive social groups, from individual household usage of small figurines to the use of large human statues and busts as part of a collective or individual representation of membership within communities. In discussing the transition from the Pre-Pottery to Pottery Neolithic, Rollefson notes that at some point between 8,000and 7,750bp, residents at 'Ain Ghazal ceased to practice skull removal and to regularly employ small and large statues in ritual and, increasingly, buried people in groups as secondary disarticulated bundles. He argues that this transition reflects a reduction in ancestor veneration and increased residential mobility and parttime residence at 'Ain Ghazal. In Chapter 8 Frank Hole critically examines the argument that the size of Neolithic settlements across the Near East reflects relative social complexity, the existence of a social hierarchy within individual communities, and regional site hierarchies. Citing ethnographic sources, Hole notes that there are many reasons why select Neolithic settlements may have been larger than others: they were political, economic, religious centers, or they were located near rich environmental locations. He argues that variation in Neolithic settlement size, however, can also be a by-product of the sequential use of settlements, wide spacing of dwelling, and the multiple use of individual structures. Comparing PPNB settlements from the Near East, Hole examines the relationship between settlement size, the presence or absence of monumental, public, or cultic structures, and evidence for elite status within social systems. While noting there was a tendency for community members from larger settlements to have more exotic, nonlocal goods, Hole argues that the concept of regional centers and settlement hierarchy may not be applicable to PPNB. Moreover, the overall size of individual settlements is not linked to the presence of nonresidential community buildings, and he concludes that the size of settlements does not appear to be linked to increased complexity in social relationships or a determining factor in the development of specialization. In a further illustration of a renewed attention to the possible links between regional settlement systems and Neolithic social organization,Alan Simmons, in Chapter 9, explores demographic shifts in the Pre-Pottery Neolithic B of the south-central Levant, as well as the process of abandonment of large aggregate villages at the beginning of the eighth millennium. He argues that this abandonment may have been related to deteriorating climatic conditions and an environmental crisis brought about by expanding population levels, intensive agriculture and herding, and deforestation for cooking fuel. 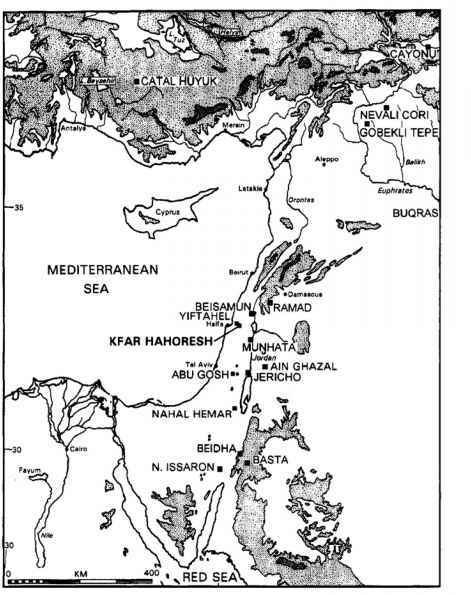 Noting that the majority of existing PPNA archaeological data appear to be located west of the Jordan River and that the majority of large Late PPNB agricultural communities appear to be located along the environmentally marginal zones of the hills along the Mediterranean and eastern desert ecotone, Simmons presents a three-stage model outlining this demographic shift. He argues that increased subsistence specialization would have necessitated more hierarchical social systems and some degree of central authority. As part of a broader consideration cf the collapse of Pre-Pottery Neolithic social systems, Simmons emphasizes regional climatic change and ecological degradation as a major dimension of the fragmentation of large regional communities and a return to smaller-scale social units. In this context, as with that of other global areas, the explosive growth of Middle and Late Pre-Pottery Neolithic B period communities appears to be linked to subsistence specialization starting in the MPPNB and culminating in the increased dependence upon select plant and animal species in the LPPNB.